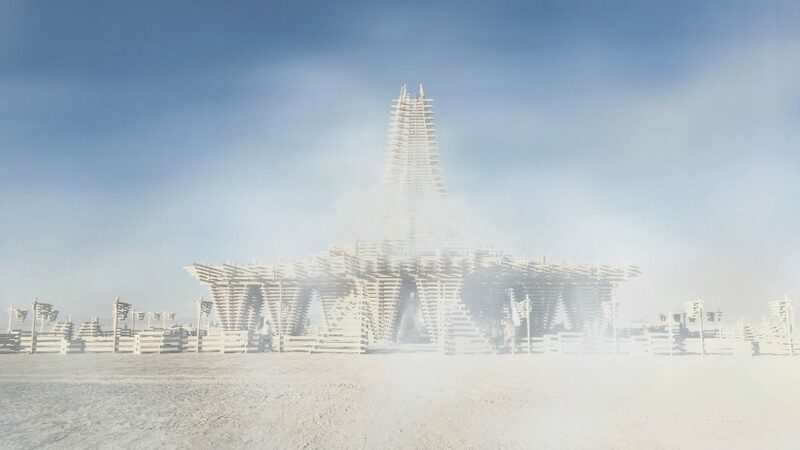 The temple at this year's Burning Man festival was designed by artist Marisha Farnsworth, and built from 100 dead trees to emphasise "dramatic changes occurring in our forests". 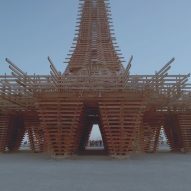 Farnsworth worked with project manager Steven Brummond and structural engineer Mark Sinclair to create the festival's 18th temple, which is used as a memorial by participants. 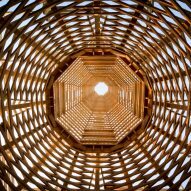 The team constructed the pavilion from 100 dead trees to represent the 100 million dead trees in California's forests. Researchers also estimate that there are 800 million beetle-infested trees in Colorado, which threaten to worsen forest fires. "There are dramatic changes occurring in our forests," said the artist. "Pines, oaks, and many other trees are dying in unprecedented numbers from diseases and pests such as Sudden Oak Death and pine bark beetles." 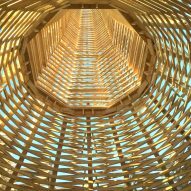 It took 100 volunteers two weeks to mill the ponderosa pine wood and stack the blocks into a structure measuring 90 feet (27 metres) tall and 150 feet (46 metres) across. The stacks formed supports around a domed space, while a hole was left in the centre of the towering roof to let in light. It was built on the sand in a prominent location, on axis with the "man". During the festival, which took place from 27 August to 4 September 2017, participants left photos, tokens and sometimes the remains of those they have lost. The structure and all its contents were then burnt at the end of the week like a ritual pyre. 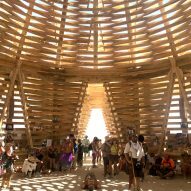 The Temple was one of hundreds of temporary structures built in the Nevada desert by the 68,000 festival attendees at the end of August each year. Highlights shared on Instagram from the 2017 edition also included an interactive illuminated tree by Studio Drift. Revellers from the design industry this year included Bjarke Ingels and Yves Behar. 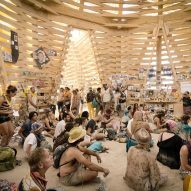 Burning Man was founded on a California beach by Larry Harvey, before moving to an urban-planned site known as Black Rock City to accommodate more visitors in 1991.